This blog is part of our online tutorial in SQL. Wise Owl also run classroom-based training courses in SQL. Perhaps the most flexible way to export the results of a query is to execute it and then either save or copy the results. Once you've executed a query you can use the Results panel at the bottom of the screen to choose what to do next. The first step is to make sure that you've selected all of the results! Click the top left corner of the grid to select all of the results. Once you've done this you can right-click in the same place and choose what to do next. You can choose Copy to get just the records or Copy with Headers to include the column headings. There are many ways to paste in Excel - here we've right-clicked on a cell but you could also choose Home > Paste from the ribbon, or just press CTRL + V on the keyboard. Now you can format the results to your heart's content. 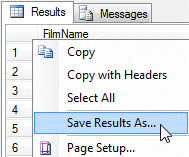 Rather than copying and pasting the results of a query, you could just choose to save them into another file. Right-click the top left corner of the grid and choose the option shown here. The default choice is CSV (Comma delimited). Here we're choosing Text (Tab delimited) as some of our film names contain commas. The numbered steps are described below. Choose the type of file you want to open. Browse to the location in which you saved the file. Choose the option shown here then click Next. In the next step you can choose which character delimits the columns in the output of the query. In Management Studio you can create comma-separated value files, or tab-delimited files. Tick the box which matches the type of file you created. 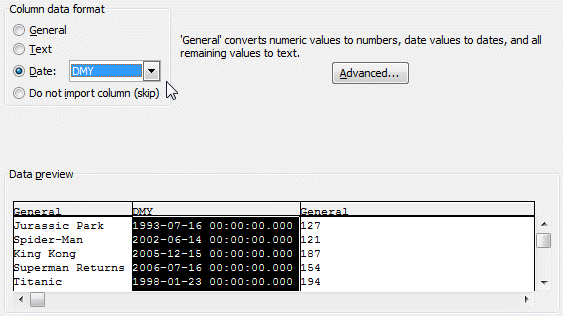 In the final step of the wizard you can set basic formatting options for the columns you have imported. Click in a column at the bottom of the screen and choose the formatting option from the top. Here we're formatting the film release dates as dates. Once your file is open you can format it in any way you like.